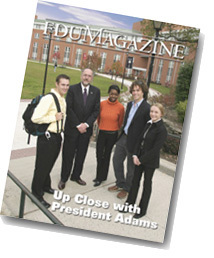 FDU Magazine Online is best viewed with Internet Explorer 5.1 and higher. The annual Academic Convocation honored distinguished faculty and outstanding staff, while paying tribute to the storied legacy of Fairleigh Dickinson founder Peter Sammartino. FDU Magazine also shares a special message from President J. Michael Adams commemorating the 100th anniversary of Sammartino’s birth. For the first time in American history, there are four generations toiling side-by-side in the workplace. Greg Hammill, human resources specialist and a director at FDU’s Silberman College of Business, breaks down generational differences and provides helpful hints for overcoming the problems that can plague intergenerational relationships and impact the bottom line. FDU Magazine Online is published two times yearly by the Office of Communications and Marketing, Fairleigh Dickinson University, 1000 River Road, Teaneck, N.J. 07666. To update your address e-mail: fine@fdu.edu.